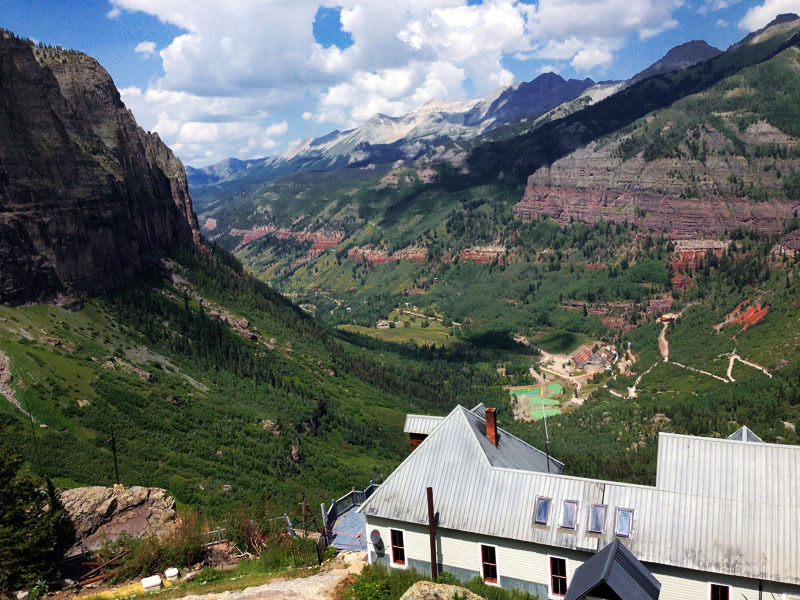 We are currently visiting Telluride, Colorado. 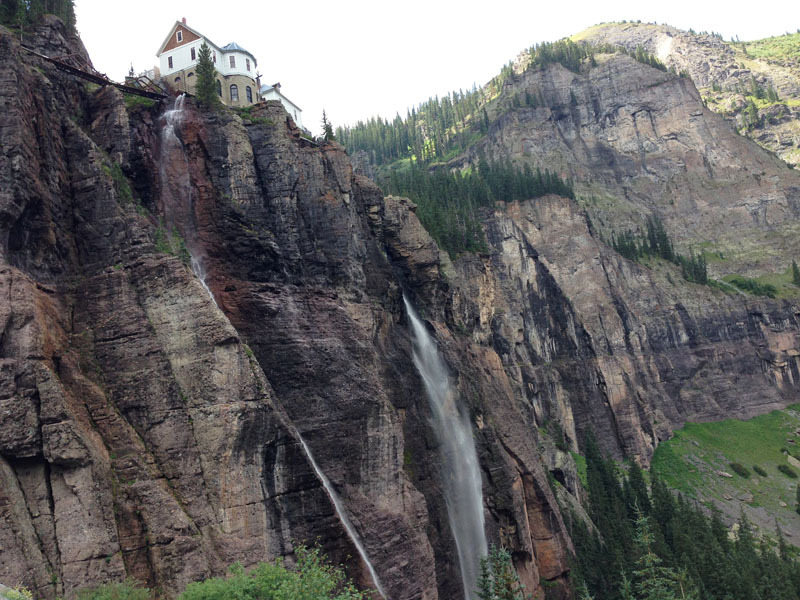 From the town, if you peer 2,000 feet up the east side mountainside, you will see a power plant that looks like a house perched upon a ledge with an incredible waterfall that gracefully falls 1,000 feet below (Bridal Veil Falls). About 8 years ago, we attempted to hike to Bridal Veil Falls with the boys and our new dog (our dog Katie was only a few months old). The hike to the top is close to 2,000 feet in elevation change and the road to the top is rocky. Many people drive Jeeps and pass you along the way. Unfortunately, the hike was too strenuous for the boys and a new puppy so we turned back about a quarter of the way there. Fast forward about 8 years later, we are in Telluride again and I think both Lynn and I wanted a second chance at the hike so we decided to give it a shot. We have been working out pretty hard all summer, so I felt comfortable that we could do it. 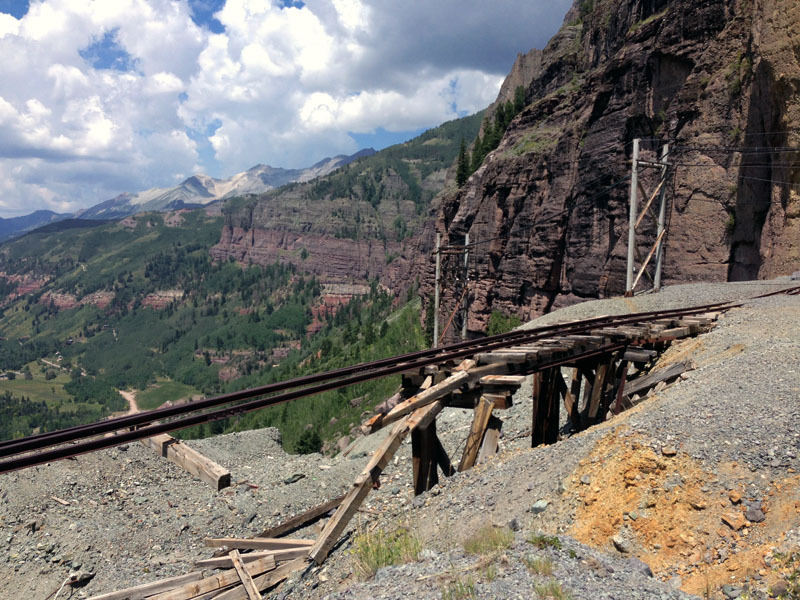 Just around the first set of switchbacks, you begin taking in the view of Telluride below. Only another 1,200 feet to the base of the falls, so we pushed on. The views are even more breath-taking. Before long, we encountered a waterfall that crosses the road and it is wonderful. My wife remembered that this was the exact spot we turned back with our kids last time. 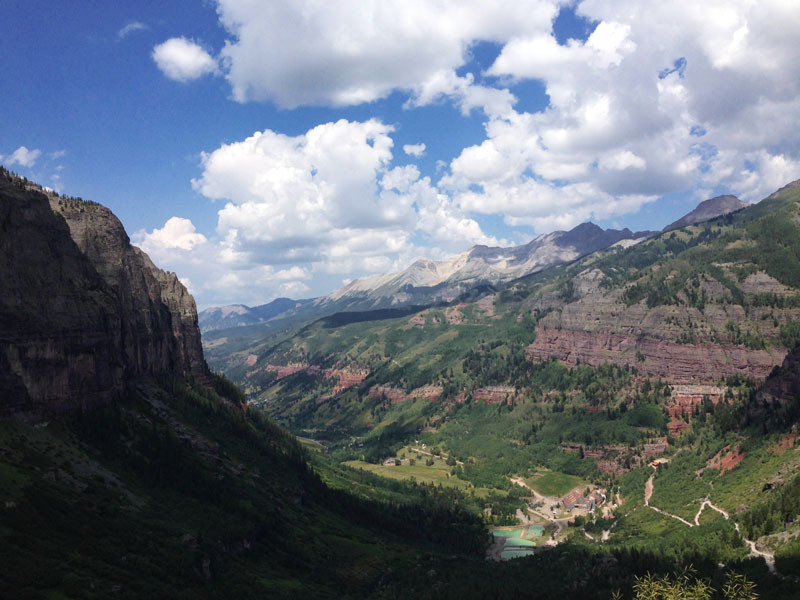 As we continued to climb, we noticed the views of Telluride became more impressive. As we walked, we talked about how we love being retired and how proud we are of our kids. We reminisced about our travels and how beautiful the world is. Forgetting the strenuousness of the hike, we looked up and we were already at the base of the falls. There was a young couple there capturing some pictures and enjoying the magnificence of the view. I told my wife if she felt up to it, we could go another half mile and see the view from above the power plant. I expected her to say “No, I’m good, we got to the base.” Instead, she said “Sure, let’s do it!”. As we started up the next set of switchbacks we met a couple that were on a 3 month trip across the western USA and were in Colorado visiting their son before they headed out on the bigger adventure. We found we had a lot in common with them and talked along the way. Time sped by, we looked up and we were already at the top of the power plant. After taking in the view, we headed back down the mountain. We noticed this section of the mountain that had previously used for mining. It had an old mining railway that was obviously dilapidated. To get this section, you had to cross over a bridge that had few wooden planks left. 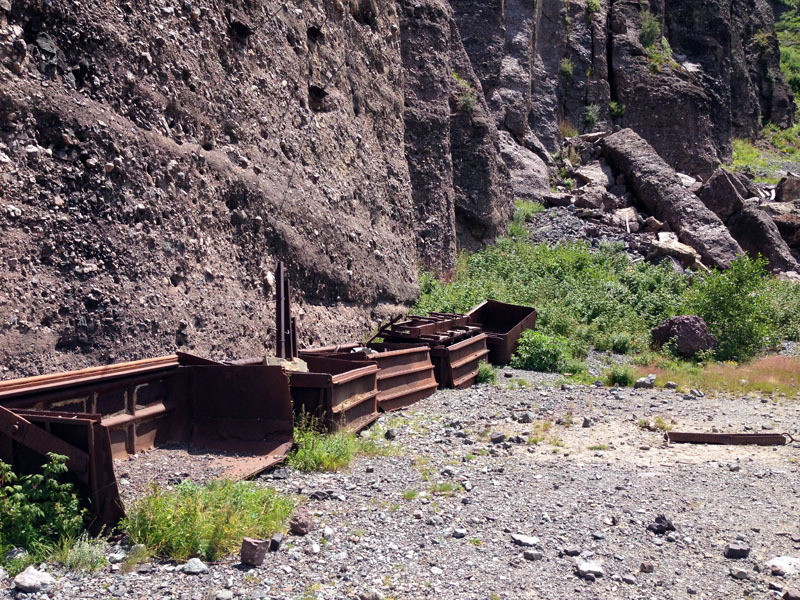 We walked around the old mining shaft and could see where the mining carts used to shuttle ore from the mountain to the mining station at the base of the mountain. However, years have taken their toll and it’s now the railway to nowhere. 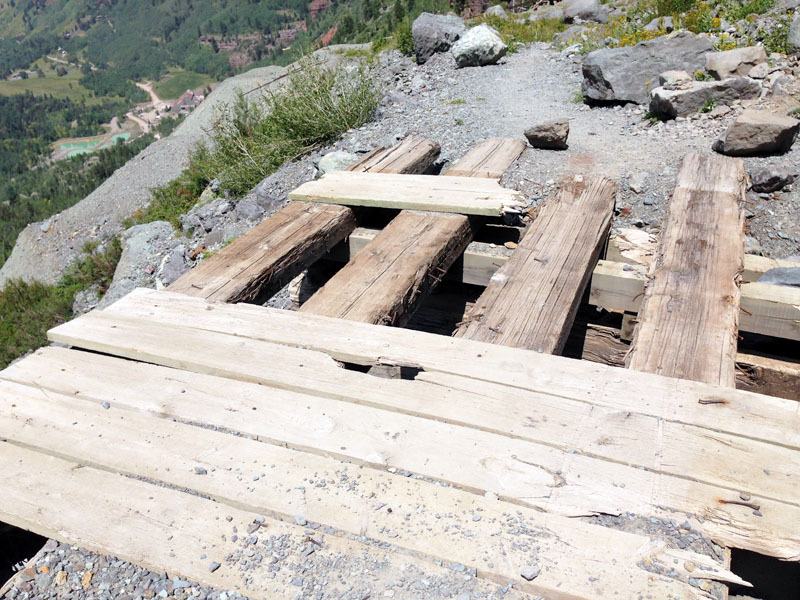 I was surprised to see that some of the old mining carts were still stacked up along the mountain ridge. As we headed down the mountain, we talked about how much easier the hike was down than up. My wife was a trooper. She stretched herself a bit with this hike and I was really proud of her. 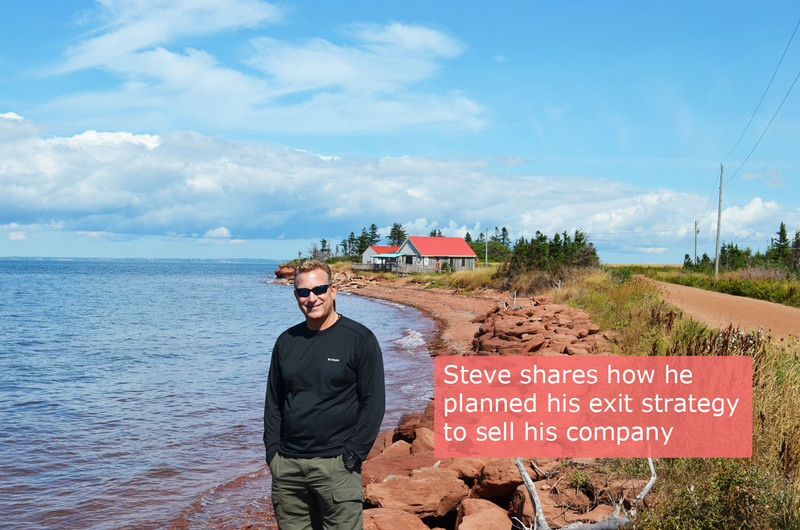 Steve uses Personal Capital to manage all of his finances and investments because it is free and very robust. If you would like to download a free copy of Personal Capital, you can do that here. 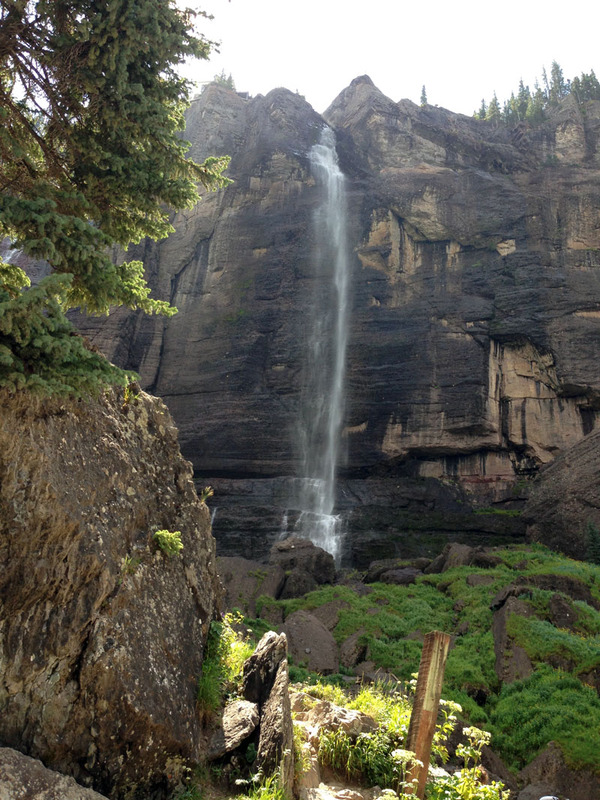 This entry was posted in Colorado, Our Travels, Travels to USA and tagged bridal, bridal veil falls, Colorado, falls, gold mine, mine, mining, ore mine, photography, Telluride, travel, veil on August 28, 2015 by smiller257. 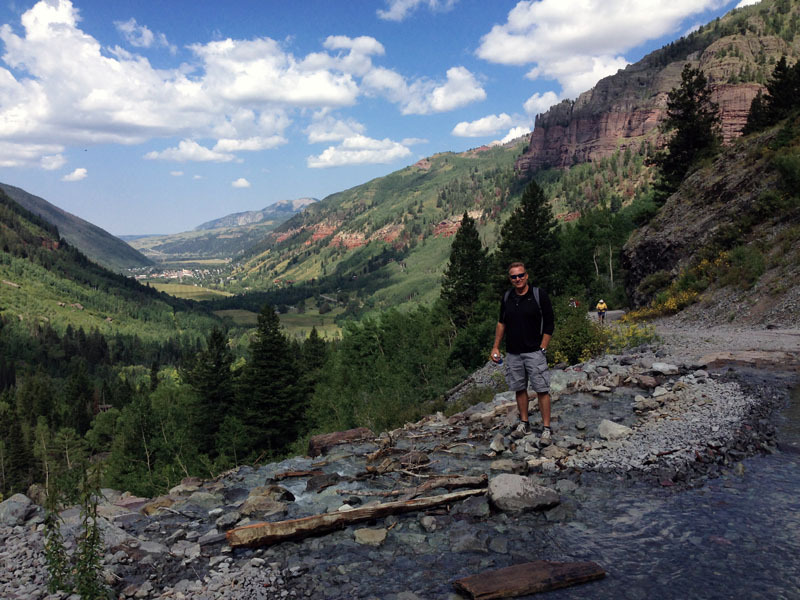 During our 2 week stay in Telluride, Colorado, we started looking around for nearby towns to visit. We happened to find a town with no residents. At least not anymore, it is officially a ghost town. 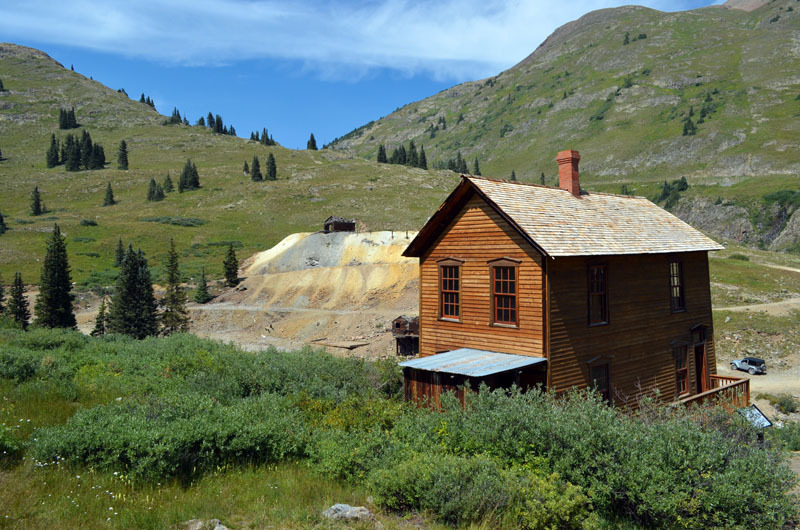 Animas Forks was once a bustling mining town. 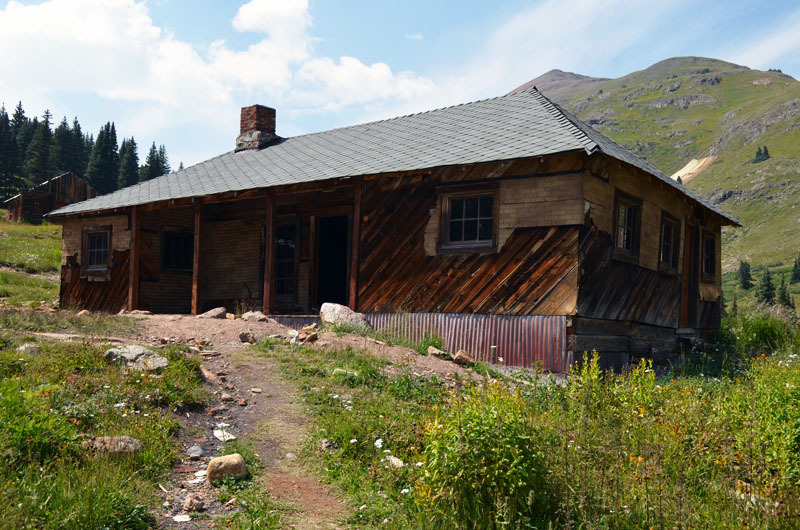 Starting in 1873, the town eventually grew to 30 cabins, a hotel, general store, saloon, and post office. They even had their own newspaper “The Animas Forks Pioneer” that lasted about 13 years. 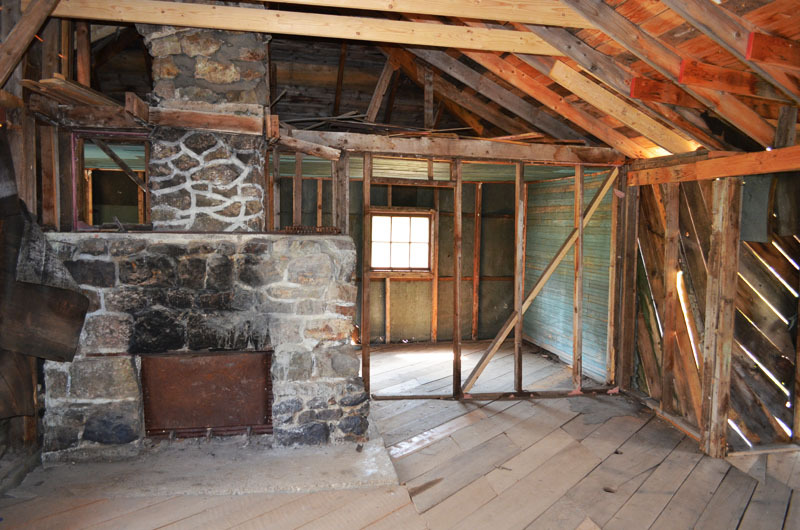 Stepping inside of the old cabins was a bit eerie, you could imagine families huddled in the small rooms after a long day of mining. Winters would get cold here. One year Animas Forks received 25 feet of snow and residents dug tunnels to get from building to building. 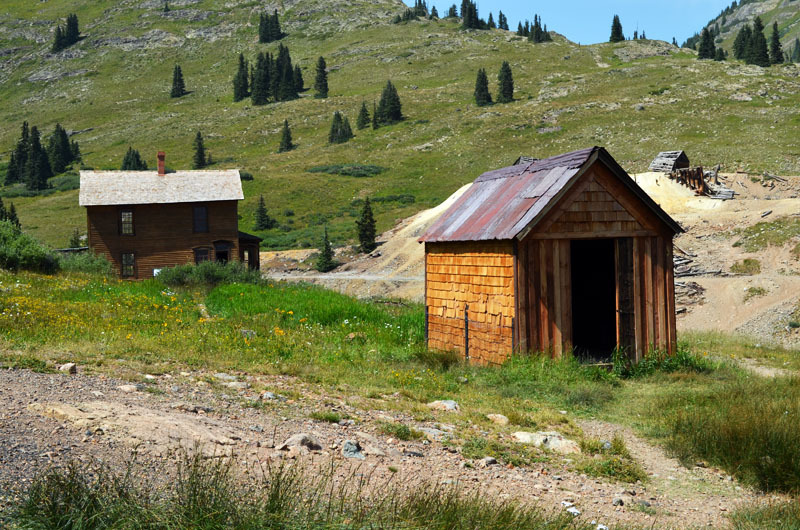 Animas Forks officially became a ghost town in 1920 when mining profits began to decline. 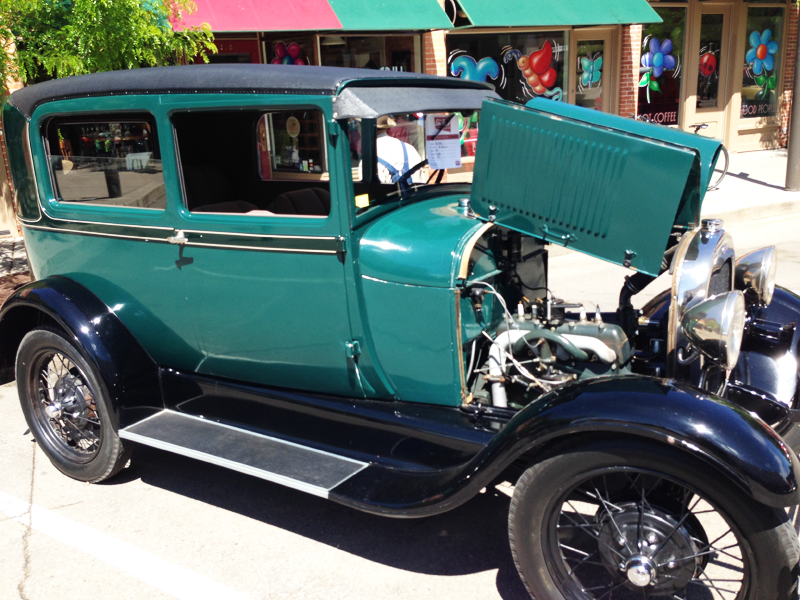 Luckily, the town is well preserved and gets about 100,000 visitors each year. 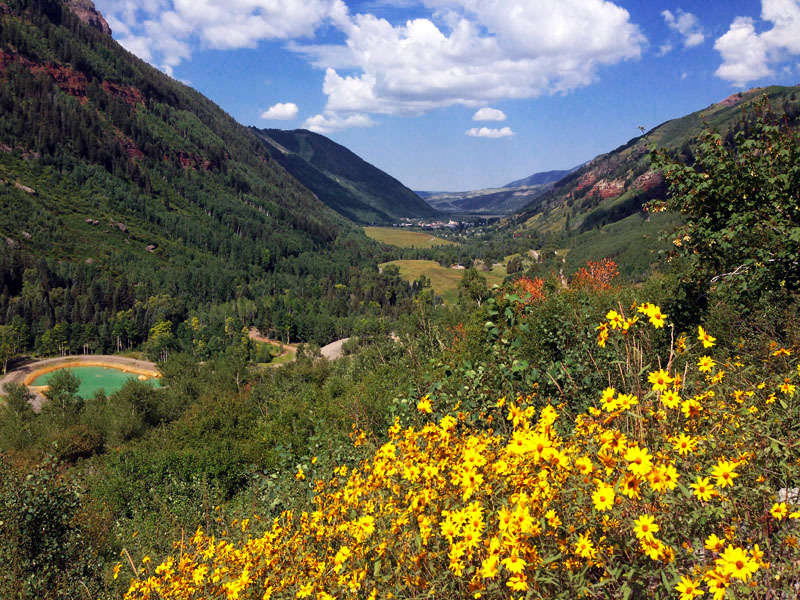 Getting to Animas Forks is a bit of a challenge, unless you have a 4 wheel drive vehicle (preferably a Jeep). 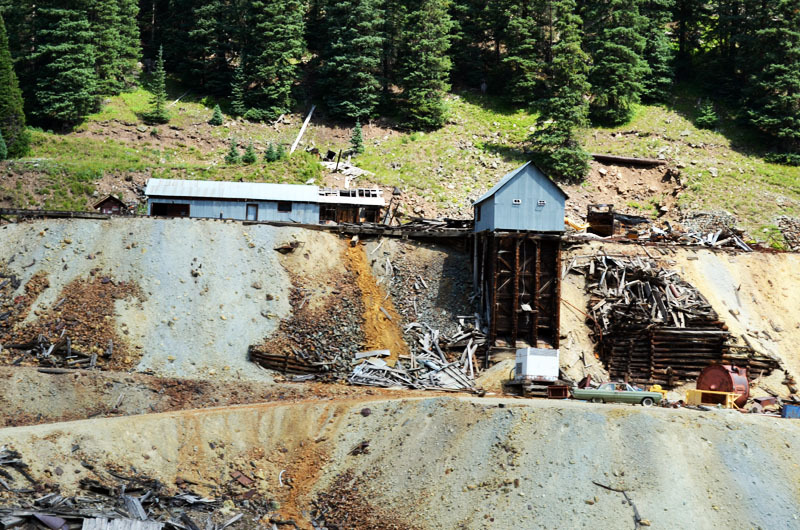 Animas Forks is located about 12 miles from Silverton, Colorado (about 2 hours from Telluride). 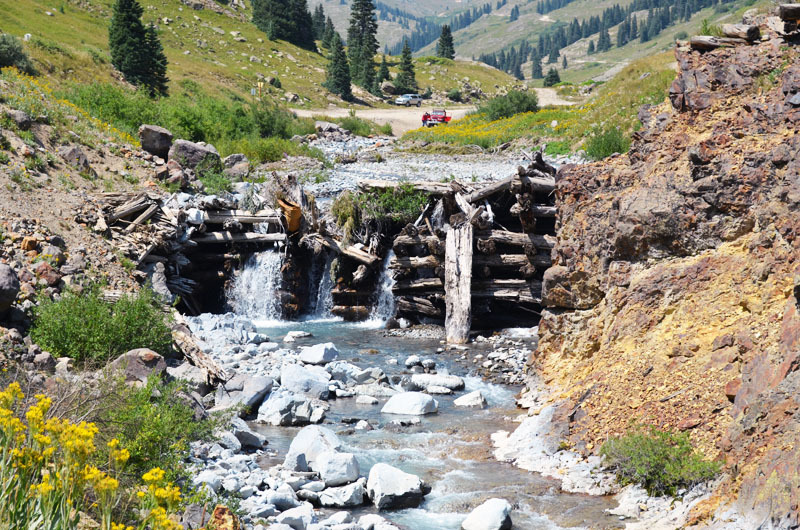 However, driving those 12 miles from Silverton can take about an hour because the road is narrow and rocky. 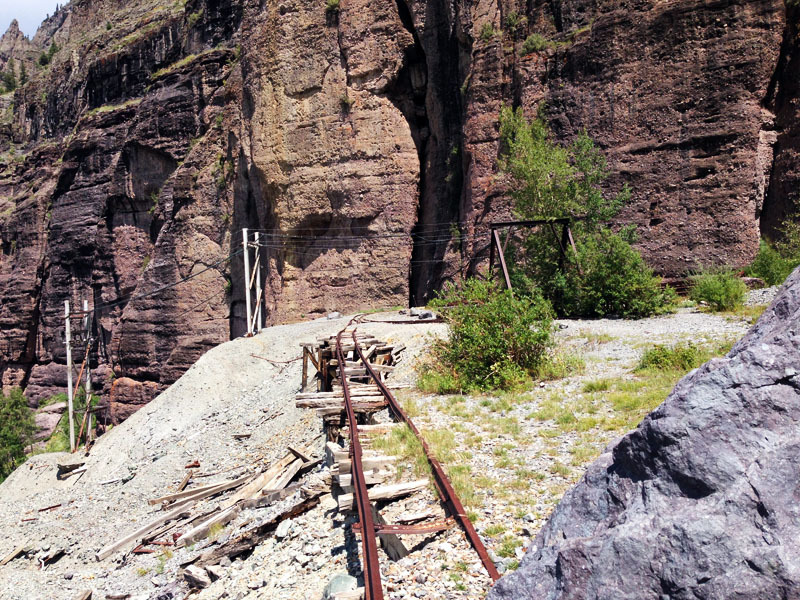 Along the drive, you will see abandoned mines. You will also catch glimpses of beautiful waterfalls and incredible views. 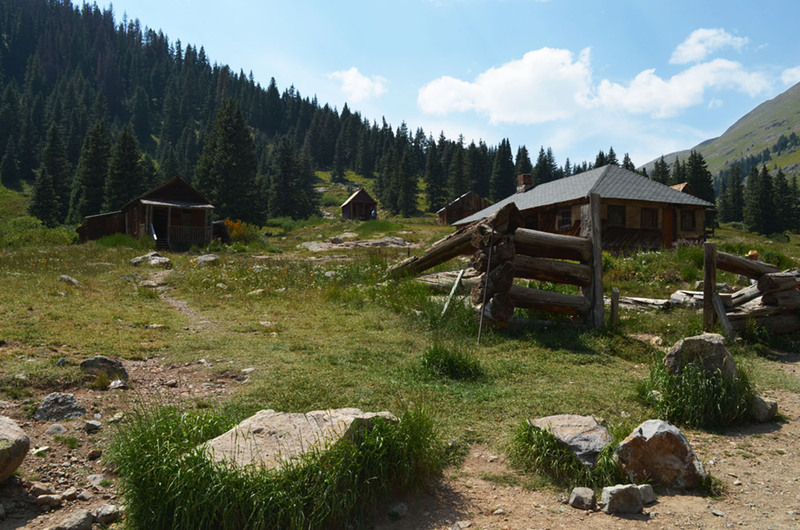 We drove an Audi 4 wheel drive up to the ghost town, but it was a slow bumpy ride. 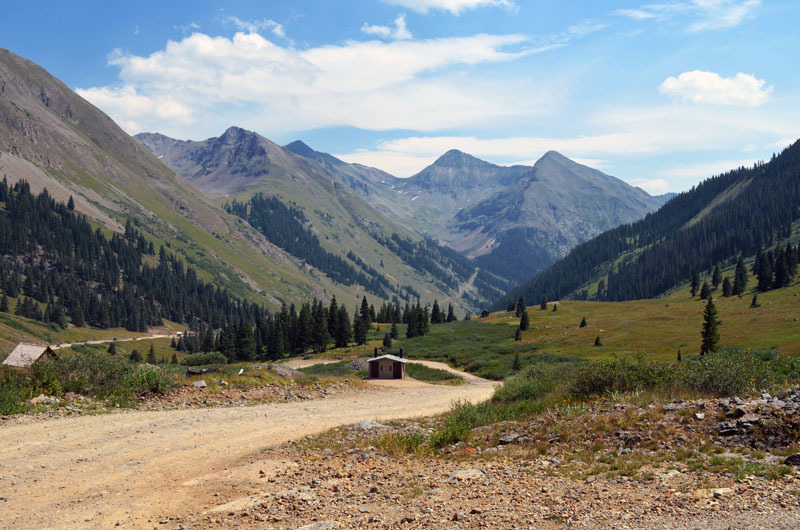 If we had it to do over again, we would have rented an ATV or Jeep in Silverton, that would have made the drive more fun and less rocky. I’ll leave you with one final picture of our view on the way back down from the ghost town. 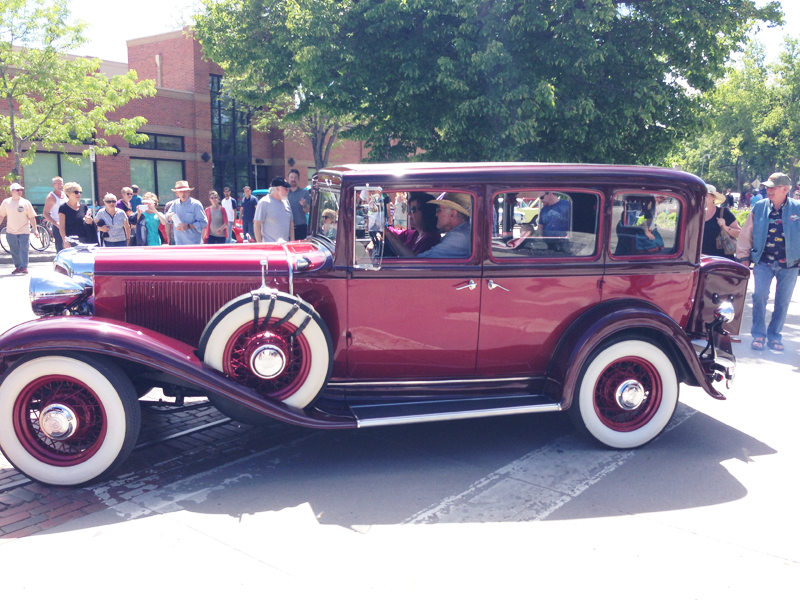 This blog chronicles the travels of Steve and Lynn Miller, a couple that retired early after selling their software company. If you would like to sign up to receive these blog posts via email, scroll to the top right sidebar of this page and enter your email address. 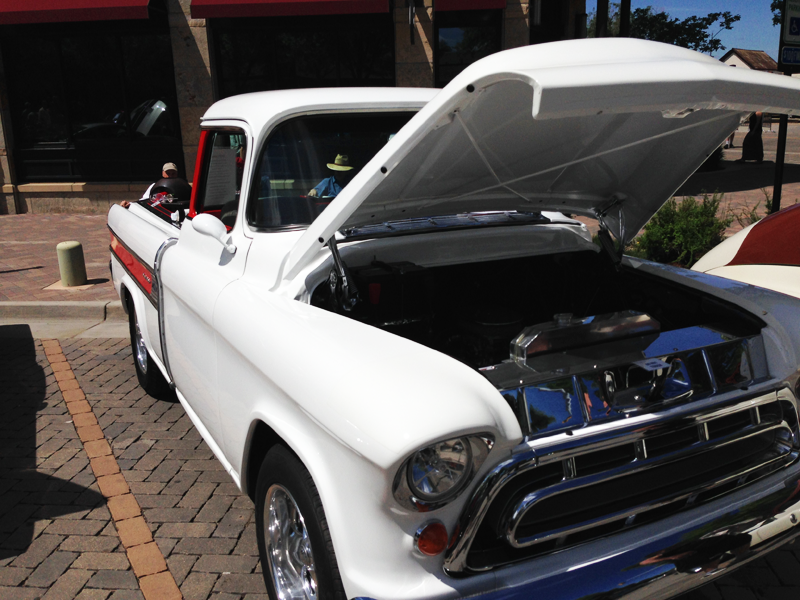 If you like this blog, you may also like Steve’s We Retired Early blog where he blogs about lifestyle freedom, financial independence and technology. 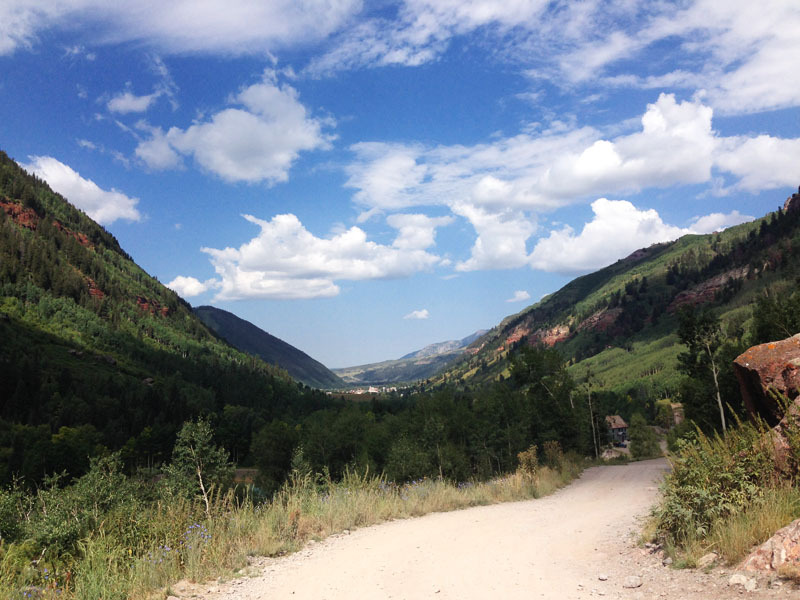 This entry was posted in Colorado, Our Travels and tagged Animas Forks, animas fort, Colorado, entrepreneurship, ghost town, landscapes, mountains, photography, Telluride on August 22, 2015 by smiller257. Jordon Bryant of ChambersDS App Academy just published this podcast with Steve Miller, who built a multi-million dollar software business and sold it in 2009 and retired. After being retired for several years and traveling the world, Steve is now creating mobile apps in between time he spends golfing, boating, cycling and keeping fit. The guest for this podcast is Steve Miller, an entrepreneur who built the multi-million dollar Pragmatic software and sold it to AutomatedQA, which is now SmartBear Software, in 2009. He has over 24 years of experience in software development, project management, and software architecture. 1:23 : Steve gives us a peak in his consulting days with Microsoft and how this influenced him in forming his previous company, Pragmatic Software. 3:21 : The solutions, features and benefits of their software, and the pivots they had made to fully develop their company including branding and building up clients to make the business viable. These strategies resulted to winning awards and, in turn, made them more attractive to other companies. 06:16 : How they ended up being acquired by creating strategic partnerships and pre-planning integrations with other vendors with products complimentary to theirs. We also discuss the value exchange that happens during cross promotions and partnerships, not only in terms of revenue, but also when it comes to building relationships. 08:46 : We dig into how he came up with a SMART exit strategy and how he ensured that this buyout plan came into fruition. Steve shares the timelines, starting out by identifying the list of companies which would be a good fit, narrowing them down, reaching out to form a relationship to those which remained as potential candidates and finally achieving the goal of being acquired. 12:07 : Steve explains what a buyout earn out is, as well as the things that companies are looking for before doing acquisitions. He adds that they are not just interested in the product but also, they are interested on what you will bring into the table. As someone who knows your product well, they would look at you to be there to support the transition initially. He also shared pay out terms during their buyout and how they exceeded revenue targets which resulted to bonuses. 14:04 : What Steve is currently doing with his free time including travelling, exploring his hobbies, and finally deciding to enter the mobile app development world. 15:10 : His amusing story of how losing his iPad spurred his genius and resulted to his first app creation, aMemoryJog. 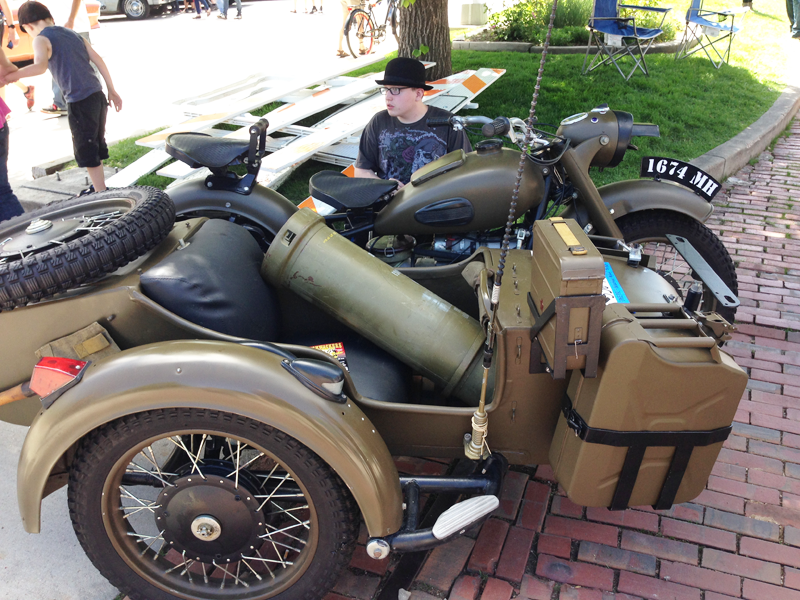 He also talks about how travel can change perspectives and about his long-term plans. 18:41 : The structures Steve had in place when he started working with aMemoryJog starting from looking at the competitive landscape, creating a business plan after his analysis, and documenting his processes along the way. 23:53 : Apart from looking at the App Store, Steve also shared his other validation techniques such as having the app reviewed with friends and family and leveraging on his network. 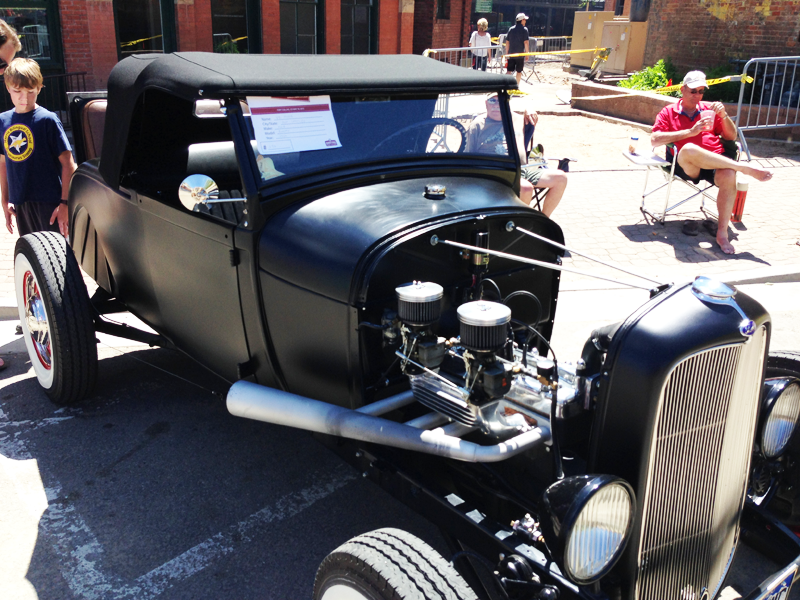 25:21 : How detailing his specifications helped him in landing a good price and using oDesk and Elance services for his app development needs. Steve also shares advice to people seeking development. 27:57 : Steve’s other marketing efforts including reaching out to bloggers to tap them to become beta testers in different silos to get feedback. He also shares how he plans to reach out to them using a template with a YouTube video and how he tracks response rates. 36:10 : Other key take aways that Steve had learned from his first app that he will be applying for the second: driving social virality through sharing capability and establishing good PR. Would you put more emphasis on the idea or the execution? How would you weigh each of them why? Everybody has an idea for an app so for me it’s 10% idea, 90% execution. What is your biggest learning lesson on your journey so far? It’s good to localize but you can localize too early. What is your favorite app? 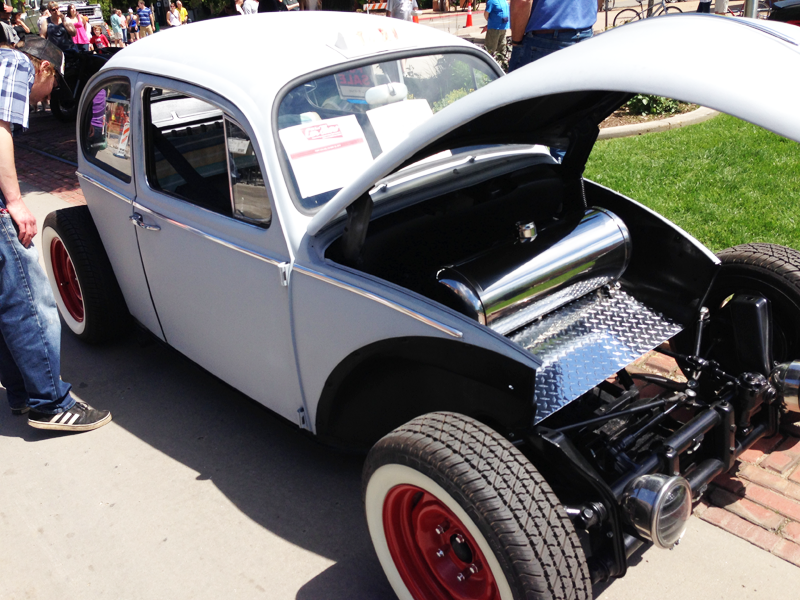 What is the coolest thing that you are working on right now that you want everyone to know about? Count Us Down. I would encourage everyone to be a beta tester! 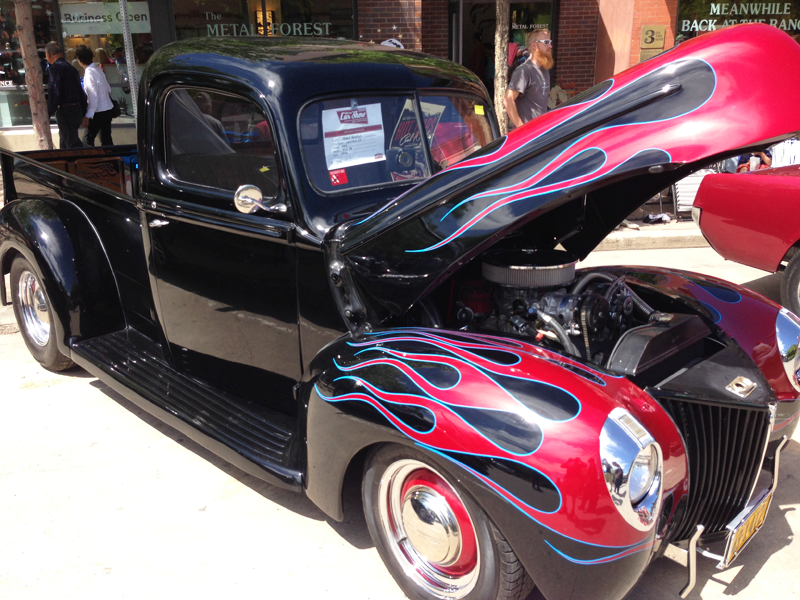 This entry was posted in Early Retirement, Money Management and tagged #CountUsDown, aMemoryJog app, business, chambersds, Count Us Down app, countdown app, entrepreneur, entrepreneurship, exit strategy, password manager, selling a business, webetripping on August 4, 2015 by smiller257. 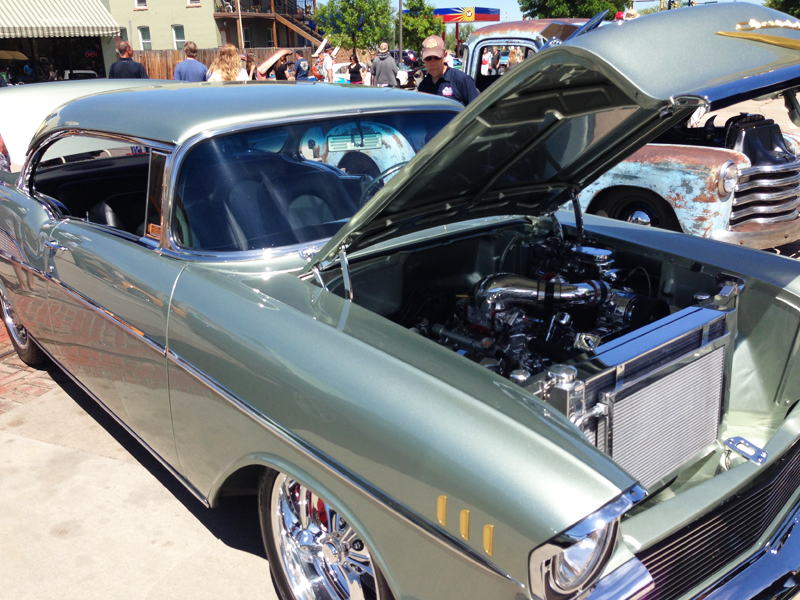 Have You Ever Visited a Car Show? 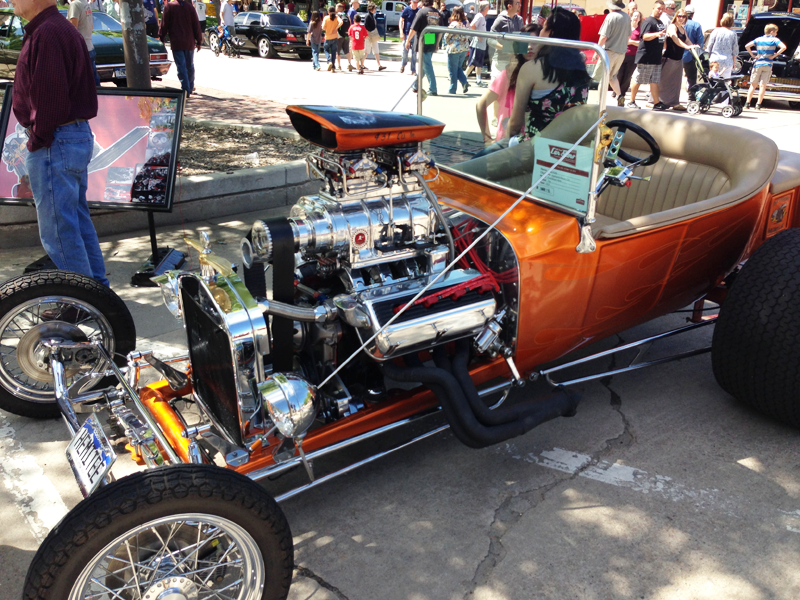 A few weeks ago, we visited a car show in Fort Collins, Colorado. 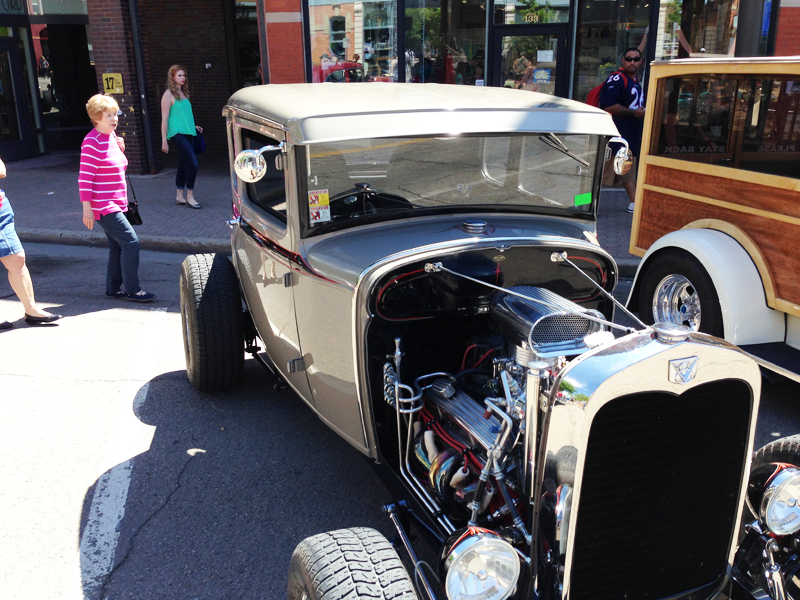 There were really cool cars there, here are just a few. Today’s post is really light on narrative, so enjoy the pictures. Count Us Down – It’s fun to count down the days to big events like vacations, weddings, births, concerts, and sporting events. The really cool thing about the Count Us Down app is that you can share those big events with friends and family and you can count down together. aMemoryJog – Organize all of your passwords and other easy-to-forget information with the aMemoryJog app. aMemoryJog works on the web and on your iPhone and seamlessly syncs together. 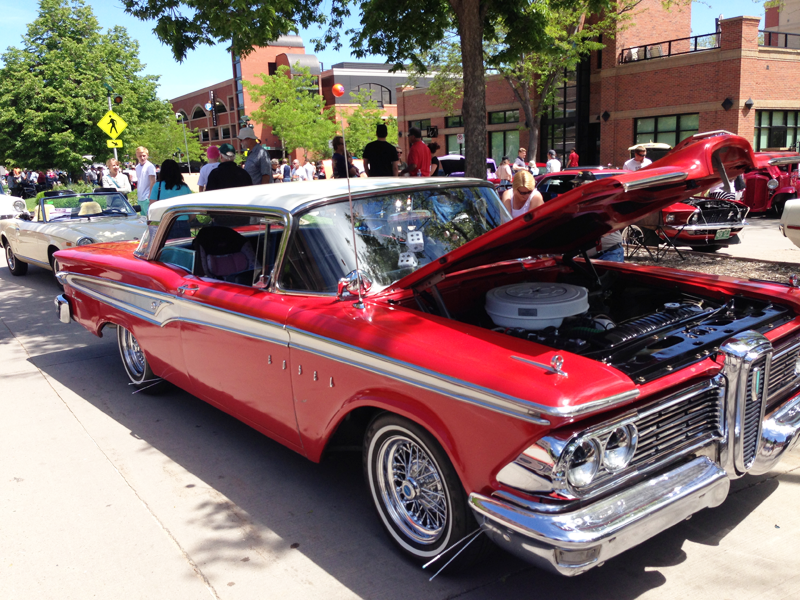 This entry was posted in Colorado, Our Travels and tagged auto show fort collins, car show fort collins, classic cars, muscle cars on August 1, 2015 by smiller257.